MACOMB, IL – As part of the celebration of Latinx Heritage Month at Western Illinois University's Casa Latina, the 2017 Latin Grammy Winner "Mariachi Flor de Toloache" will perform at 2 p.m. and 7:30 p.m. Tuesday, Sept. 18 at the College of Fine Arts and Communication Recital Hall. Both performances are open free to the WIU and Macomb communities. 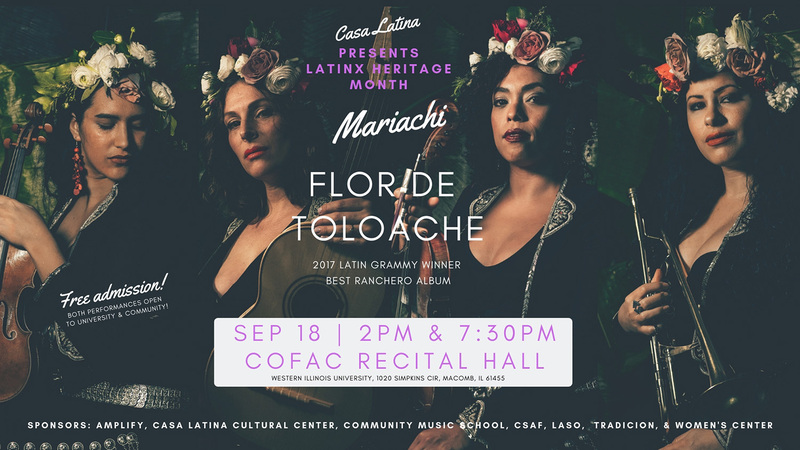 "Mariachi Flor de Toloache" is the first and only all-women Mariachi group. The band was formed in 2008, and is led by singers Mireya I. Ramos (founder) and Shae Fiol (founding member). The members are from diverse cultural backgrounds such as Mexico, Puerto Rico, the Dominican Republic, Cuba, Australia, Colombia, Germany, Italy and the United States. The performance is sponsored by Amplify, the Casa Latina Cultural Center, WIU's Community Music School, CSAF, LASO, Tradicion and the WIU Women's Center. For more information, contact Casa Latina at (309) 298-3379.